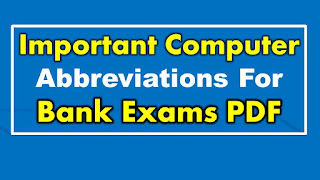 Important computer abbreviations for Bank Exams PDF Download: In this article we are provide important List of Computer Abbreviations with definition of every word. You can download it as PDF file from the link provided below. If you are preparing for SSC, IBPS, or Bank exam then must read it one or more time. Accordingly to previous paper of this examination, Minimum of one or two questions must ask from this topic. So it is highly recommended for all candidates to prepare the computer section in any exam syllabus. Every Computer geek always learns more about Computer. In computer Knowledge we use many different terms. So if you going to attend any Computer exam or any Interview these terms are useful for you. When we use abbreviation form in daily life we don’t know its real mean, that’s why we puts some Important abbreviation forms in this post for increasing your knowledge in Computer. In this post we post some basics and important full form for you. If you learn all of these forms, your knowledge is more increasing about computer. Computer abbreviations are most important part of computer awareness section generally asked in all major comparative exams like SSC, IBPS and other government exams. So, it is wise to remember all important computer abbreviations. There are many books in which these abbreviations are given but very less in number. We have listed all important computer abbreviations in this article. It means you will have a sufficient list of computer abbreviations in pdf format which you can use as a reference for all exams .If you don’t have a pdf reader still you can view it online. Just read the whole page. In this article we provide all important computer abbreviations for aspiring candidates. We all know that Computer Abbreviations is one of the important key topics for every Bank exams. 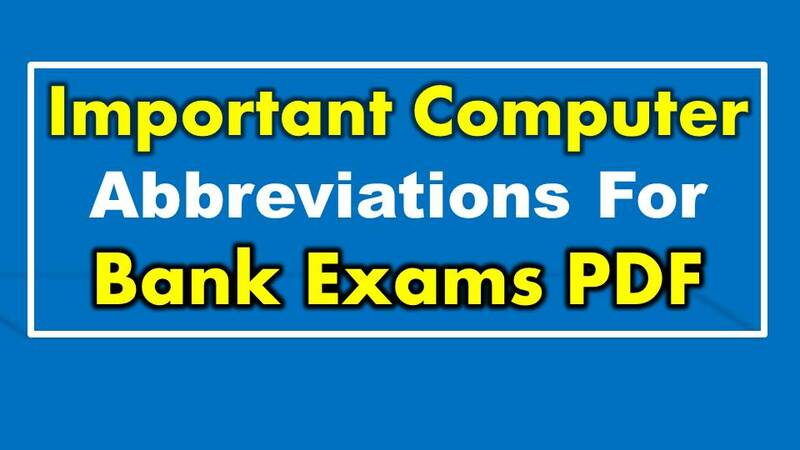 So, today we are posting you some "computer abbreviations PDF for bank exams complete list as computer abbreviations pdf free download with " download link. This PDF is much more helpful for competitive examinations. You will find these questions in SSC CGL, SBI PO, SBI Clerk, IBPS PO, IBPS Clerk, Railways RRB, LIC AAO, UIIC AO IBPS,SBI Clerk SBI PO, RRB, UPSC, TNPSC etc is available here with full forms, meanings, definitions. All Candidates who are willing get the merit marks in their upcoming bank examinations should concentrate on each and every part in Exam. Because candidates must have to score above cutoff marks in each sections. So, Aspirants should concentrate on scoring sections like General awareness and computer awareness sections. These two sections take less time and carry maximum marks. MM team are advising all aspirants that concentrate GA and Computer awareness sections to score better high merit marks to get top rank in IBPS / SBI or any other upcoming recent bank examination.